Nathalie Love is another new kid on the block who has been showcasing her style on the red carpet during the 2013 Toronto Film Festival. Palo Alto Premiere: The actress joined Gia Coppola on the red carpet this weekend wearing a Saint Laurent Fall 2013 halter dress styled with the same embellished waistband we saw on the runway, adding black pumps and a black clutch to her look with a touch of crimson-red to the lips. 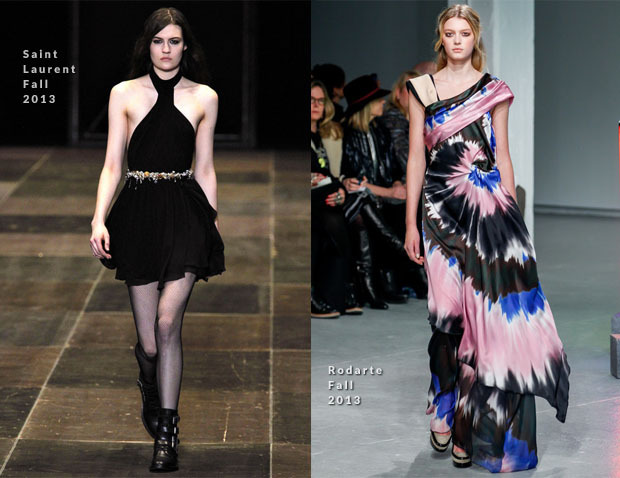 Guess Portrait Studio: While hanging out at the portrait studio the actress wore a more colourful look, wearing a Rodarte tie-dye dress with a wrap skirt from the Fall 2013 collection which was originally presented with this print as a gown. Once again she opted for simple black pumps. Hopefully we will get some more varied footwear choices from her in the future.